We’ll spare you the detailed history lesson, but to sum it up, demand for air travel skyrocketed in the ‘50s and ‘60s as aircraft production improved and airlines started to connect more and more major cities. This was fantastic news for consumers, and airlines—more options, more profits. But then, as is the case with any rapidly growing industry, the personalized service that defined The Golden Age of flying declined just as rapidly. Along with the service went the excitement and style once associated with air travel. At some point along the way, the fun went out of flying; and at some point later, the convenience did too. Conversely, private air travel isn’t looked to as an alternative. How could it be? Though the benefits are ample—privacy, efficiency, comfort—it’s not financially realistic for most. And unless you’ve got one in your personal hangar, private jets can’t be ready on a moment’s notice. The economics simply don’t make sense for a mainstream market. Things had to change. There were those out there still holding on to a sliver of hope, the ones who appreciated how flying transcended all other forms of travel. They were consistently building their lives around flight schedules already, regardless of the inconvenience. They were entrepreneurs, inventors, captains of industry, adventurers, and world record breakers. In essence, they were the Surf Air Member. We knew they were out there. So we created a solution for them. Hill had racked up two million miles on United, but couldn’t bear the experience any longer. We created Surf Air for her. We created Surf Air for Todd Lewis, who lives in Tahoe and works in Palo Alto; for Lynn Koegel, who lives in Santa Barbara and runs an autism research facility at Stanford; for James Aviani, who didn’t want to uproot his family when he took a job 400 miles away from home. We did it for all the business people who were wasting time and money on commuter flights—facing daily cancellations, spending unwanted hours in the car. We did it for the families who wanted to see their loved ones for dinner, the kids who wanted mom or dad to tuck them in at night. We did it for the people who couldn’t sit still on the weekends and wanted to explore everything their state had to offer. We did it for people who love to travel, and even, for those who don’t. Left: Lynn Koegel hugs Eileen (Surf Air Flight Concierge) before her flight to the Bay Area. Right: James Aviani working in the Surf Air lounge prior to his flight to Los Angeles. So how did we do it? As complex and challenging as reinventing air travel is, the answer is quite simple. We started with a venn diagram of the two currently existing air travel solutions: private and commercial. In the middle was the growing vacuum where our members worked and lived—there was nothing just for them, no in-between. So we took the best of both and made one better. We built a high-frequency flight schedule to accommodate everyday commuters. We flew in and out of more manageable private airports in major cities, eliminating the chaos and crowds. 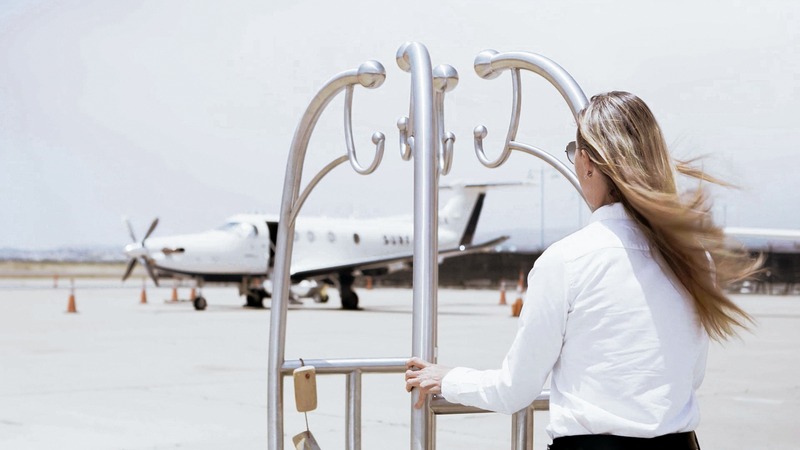 We infused our entire service philosophy with hospitality, inspired by iconic hoteliers and restaurateurs, not airlines. 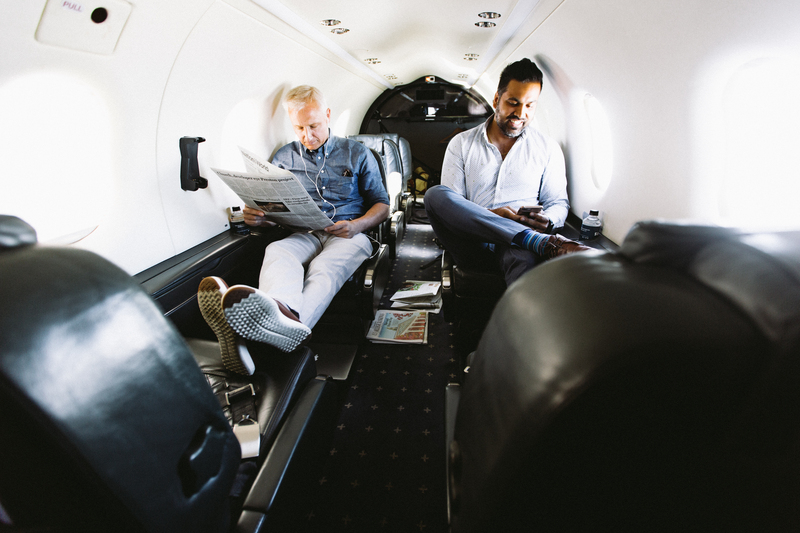 We focused on building and fostering a tight-knit community, and created spaces—like our eight-seater executive planes—that made connecting comfortable and easy. Lesley (Surf Air Flight Concierge) walks the bell cart of members’ luggage out to the plane before boarding. It wasn’t pretentious and it wasn’t the rough-and-tumble world of the Southwest boarding line. It was the feeling of checking into your favorite boutique hotel; seeing regulars in the lobby; and getting to your destination with hours to spare. 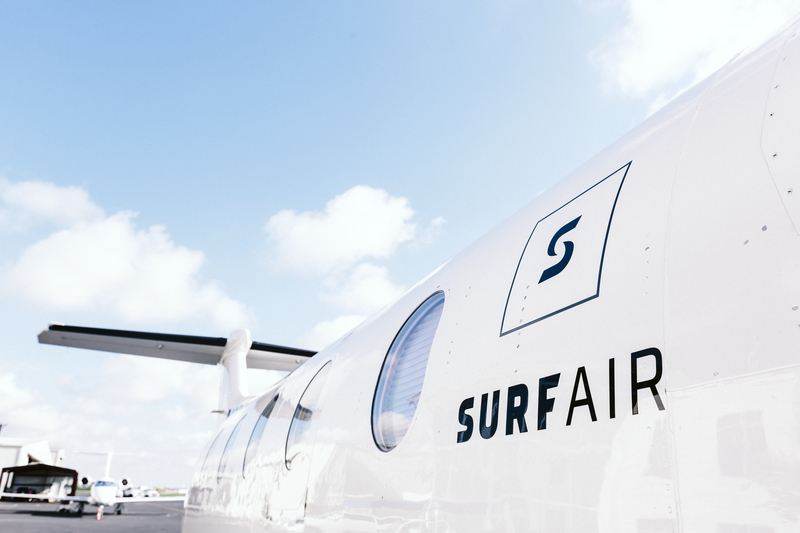 Surf Air eliminated the stress of flying, which put people in a good mood. Before we knew it, we saw the possibilities unfold. Partnerships made, businesses launched, and friendships formed. And the center of the venn diagram grew. It became its own category, designed by and for Surf Air members. The Lost Travelers who so desperately wanted something simpler, and were willing to pay a slight premium for it. The freedom to fly when and how they wanted—quickly, efficiently, and without weeks of advanced planning—transformed the way they traveled, but also the way they lived their lives. Surf Air TX Members kicking back on their flight from Dallas to Houston. Today, we continue to look for ways to expand on what we’ve already created. If we can change flying, why not change all the other elements attached to it: hotel accommodations, weekend trips, expedited access at busy commuter hubs like LAX and SFO. Our membership unlocks a new world of air travel efficiency, but it goes beyond that. When every aspect of travel becomes effortless, our members are free to put their energy elsewhere. In the past five years, we’ve continued to expand into new territories and present new opportunities for our members to connect and improve their lives. There’s no stopping now. We’re full force ahead. Our members are by our side, committed to securing this new category of flying. It’s the solution created just for them, and for anyone ready to get where they need to go without delay—in the world, and in life.